Looks great, Kari. Thanks for trailblazing. I'll be re-joining the bandwagon soon, once my walls are pit together. I had hoped to start in October, but the cold got the best if me. With so many people building beautiful work benches, my own, very utilitarian one seems so un-worthy. 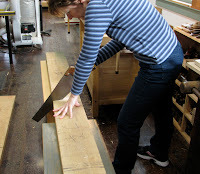 I'll be watching your progress and hope it will inspire me to make my own traditional bench. I love my little Roubo...but now I need to build a joinery bench! Megan, I hear you on the joinery bench. Dyami, I'm sure it's frustrating wanting to work on your bench but having to finish some necessary projects first. No fun. Jeff, it's really spurred me on seeing so many people building their benches. Megan, you can never have too many benches. Just ask Chris. 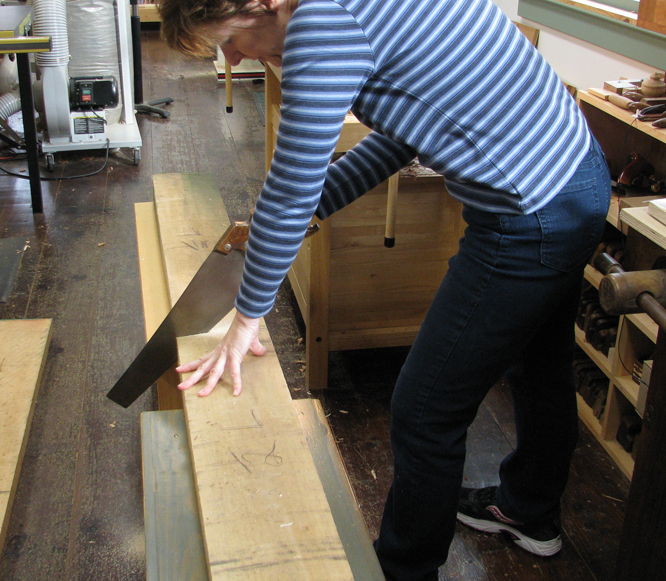 I ended up hand sawing my timbers, too. I was just too nervous about the kickback any other way. You've got some nice beefy stock. Have you already settled on all your final dimensions? I'm going taller than Chris' formula on the pinky joint. I pretended to do a bunch of different things to determine my final height. I like to do a lot of work from my shop office chair. 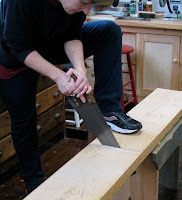 I'll be gluing up my first petite Roubo bench (2' x 5') this coming week with at least enough 4x6 tulip poplar and 2" maple butcher block slabs for another three or four to fit my workshop/classroom needs. 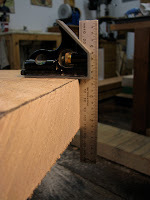 I will also be fabricating a 12' 10 x 10 planing beam witch can serve as a joinery bench. Good luck on the bench. I just got mine done and now every project I work on feels supper quick. I am sure that will wear off after a while. Looks like you are cutting with a 20" panel saw. You should look into a larger 26" disston, it will make the cutting go a little faster. Have fun. can't wait to see the updates. I've been reading through your blog, you've done some great pieces! I'm building a Roubo bench myself using some salvaged doug fir beams. My first real experience with truing up stock by hand. I'm eager to see how your bench progresses. Any idea what you're going to do for vises? I, too, would like to build a new bench. It's amazing how versatile a good vise is and how I've managed to work without bench dogs. At the very minimum, I should take the time to bore some 3/4" holes in my bench. Vic, your timbers make mine look like toothpicks. My bench will be about the same size as the one I've been using for 20 years: 33 7/8" tall x 58" long x 19 1/2" deep. Like yours, mine is taller than the normal formula for setting bench height. Bill, I'm starting to get a nice collection of handsaws, some as long as 26". This is my shortest—only 18"—but it has the most aggressive cut of all my crosscut saws. Recently, I picked up a couple more antiques that are a little longer; I just need to find time to sharpen them. Joe, salvaged lumber looks awesome in a workbench. Good luck with your build! I bought a leg vise from Lake Eerie Toolworks. That will be the only vise. I'm forgoing an end vise because I realized I never use the one on my existing bench. This will free up the right-hand side for sawing. Chris, I'm going with 3/4" round holes in my bench, too. 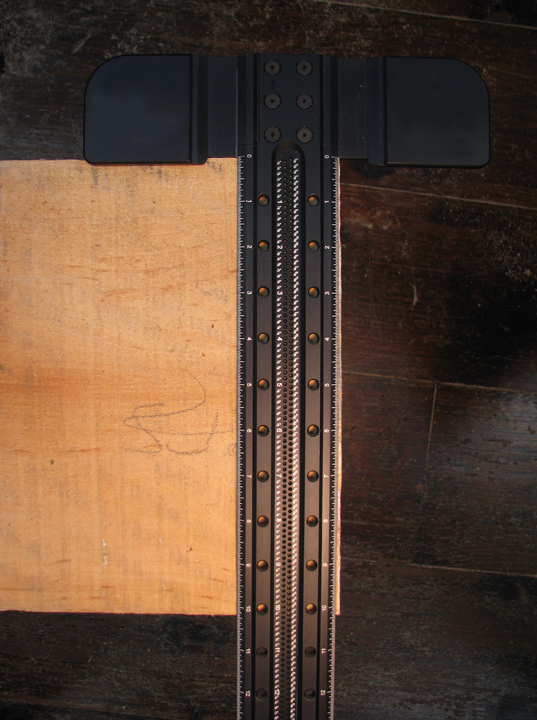 I prefer the look of the traditional square holes, but the round ones work so much better with jigs. Woot. I'll be joining you with a new bench sometime this year, too. Great start Kari! I too have wanted to build a good quality bench for a while and with everyone else building the timing seemed right. I can't wait to see your progress as you go. I have no doubt that it will be a beautiful work of art. Brian and Chris, good luck with your bench builds! It's energizing and inspiring when so many woodworkers are building one. Great point about slowing down with the hand sawing Kari. It seems counterintuitive but you will go faster by making slow and controlled strokes with the saw and even breathing. More importantly, by lifting the saw out of the cut on the back stroke you will end up with a more accurate cut. Great stuff. The hard part is figuring out how you can bring it to show and tell at the next SAPFM meeting. Kari, take your time and pace yourself. My bench took me three years. I started with a sugar maple which had been uprooted by a wind storm. 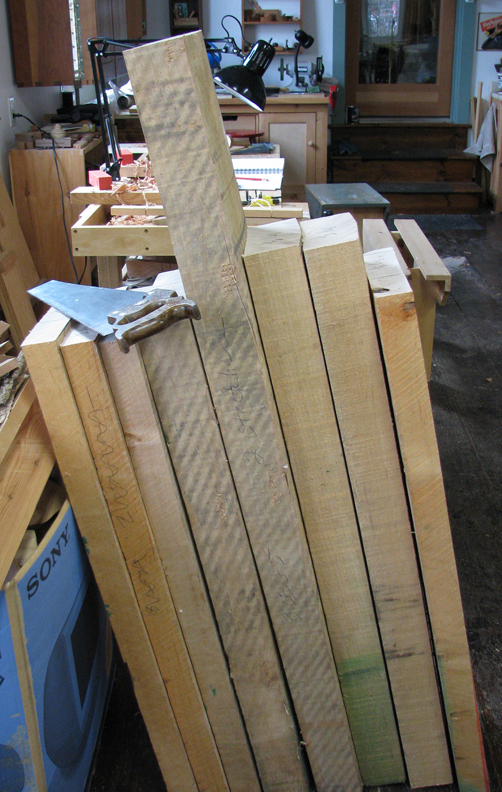 A weekend with a RipSaw bandsaw mill netted me the rough cut stock. After two and a half years of air drying, attic drying and a dehumidifier powered "kiln" I was ready to start building my bench. The end result is a tool that fits me perfectly and is used every time I'm in the shop.